Twitter was awash with complaints late yesterday as celeb stalkers noticed they could no longer access a number of famous tweets - including that Oscar selfie. The micro-blogging site said it was working on a fix about 12 hours ago and it has yet to provide an update, but the missing tweets appear to be slowly returning to Twitter. Those clicking on the affected tweets were greeted with the unwelcome message "Sorry that page doesn't exist". The sudden disappearance of the tweets led to some panicky fans moaning to Twitter saying shouty things like "Get it fixed NOW!!!" and "PLEASE IM LITERALLY GONNA CRY PLEASE SORT IT OUT." The Register has asked Twitter if all is well with its glitchy system now. But it hadn't got back to us at time of writing. 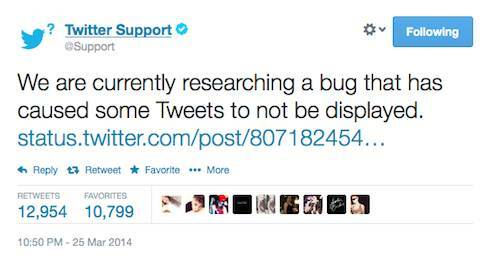 Meanwhile, its Twitter Support account is still carrying what appears to be a stale statement about the missing tweets bug.